This Bathtub Grab Bar Safety Rail by MedLinel was designed to fit just about any style of bathtub. 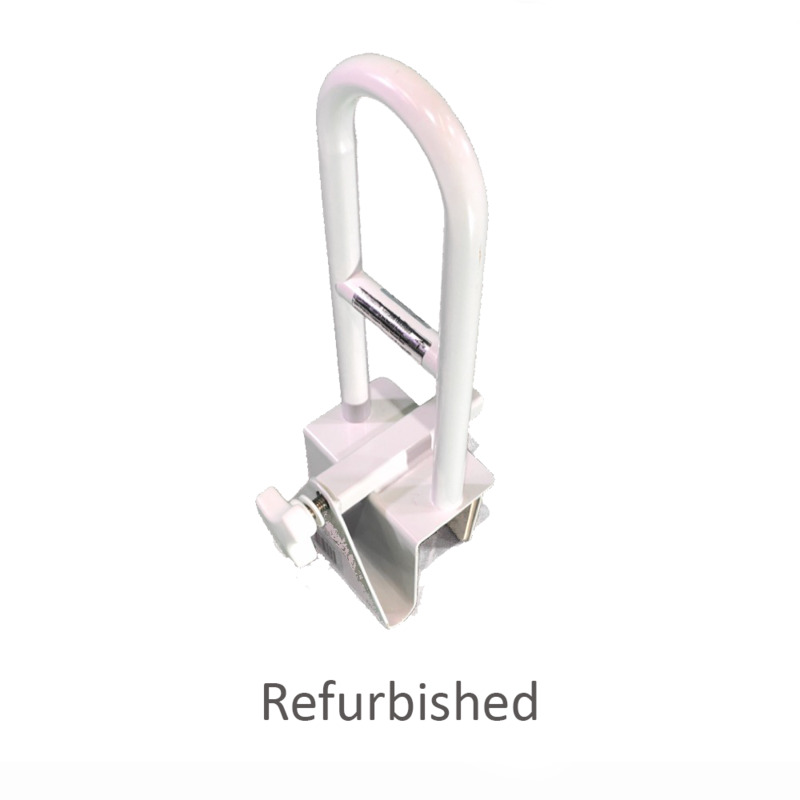 The attractive white powder coated steel frame is durable and aesthetically pleasing. These bathtub grab bars offer a step-through design that provides unobstructed ingress and egress. The smooth design offers better hand positioning. Finding the right tub safety bar for safe entry and exit from the tub should not be difficult. The popular Medline Deluxe Tub Grab Bar has a simple design that is easy to use, easy to set up and requires little effort to maintain. The tub support bar has a step-through clamp design that makes it easy to step into and get out of the tub without any interference. 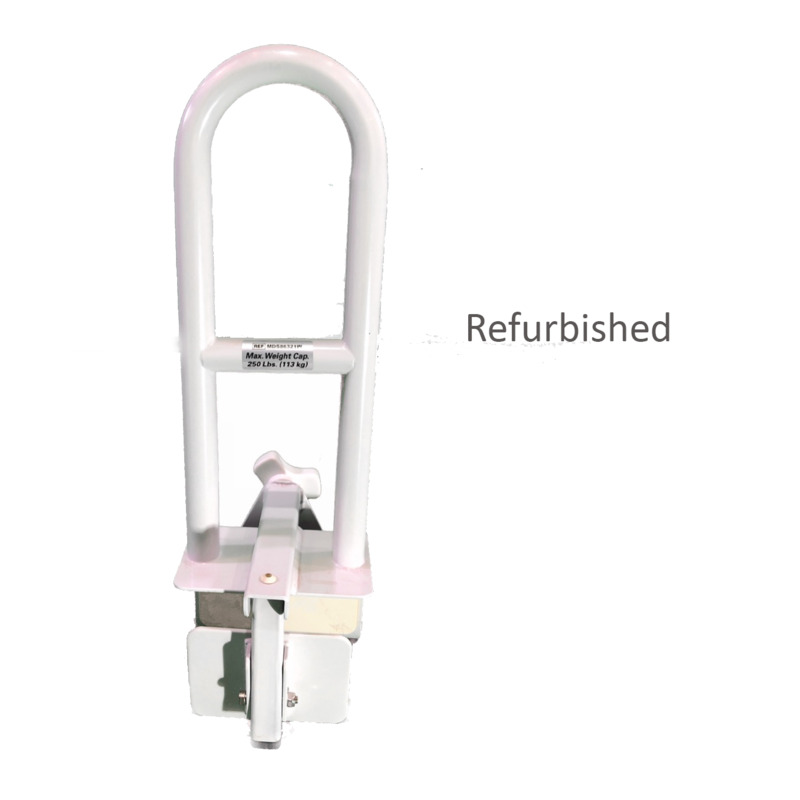 The tall handle with both a curved and straight bar allows the user to use two hands for extra support. Installation is easy with the clamp-style design that does not require any tools for installation or removal. These tub assist bars clamp on the tub to allow you to position it anywhere on the side of the tub that meets your specific needs. About Our Warranty On Refurbished Products: Our refurbished products have gone through a thorough inspection process followed by an in-depth methodology for sanitation in adherence to Federal Medicare guidelines. Accessibility Medical, LLC guarantees this product to be free from defects other than those outlined in the description, under normal use and conditions, for a period of twenty-one (21) days from the original invoice date. If applicable, shipping and handling fees are to be paid for by the customer. Accessibility Medical, at its option during the warranty period, to repair any defect in material or workmanship or to furnish a repaired or refurbished product of equal value in exchange without charge (except for a fee for shipping, handling, packing, return postage, and insurance which will be incurred by the customer). Such repair or replacement is subject to verification of the defect or malfunction and proof of purchase by the receipt. Additional extended warranty can be purchased from Accessibility Medical LLC.